Unique Valentine Gift presents The Duke of Orleans Treasure Chest. 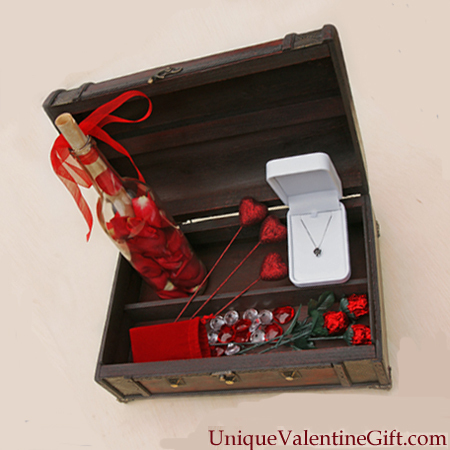 Wow the object of your affection with this truly unique treasure chest filled with an assortment of gifts for your Valentine. Complete with our premium message in a bottle filled with real long-stem rose petals, the love poem printed on parchment paper, tied with a satin bow and inserted into a silk and velvet bottle sleeve, solid milk-chocolate roses and a velvet bag with Akasha gems. This item also features a beautiful heart-shaped 2.47 carat garnet necklace that is hand crafted in the USA. The gem is set in a four prong, raised sterling silver heart-shaped setting with a delicate 18 inch sterling silver necklace. Atop the garnet is mounted a .05 carat brilliant cut diamond in a three prong setting. The name of this gem stone is derived from the Latin word "granatum" which means pomegranate because of its resemblance in color with Pomegranate seeds. This stone is believed to regulate the heart and blood flow and aid in curing depression and lethargy. Garnet stone is also said to help in increasing the passion and sexual drive.This Treasure Chest is named after Charles the Duke of Orleans who is credited as writing the first Valentine Love Letter to his wife Bonne of Armagnac while he was being held prisoner in the Tower of London following his capture at the Battle of Agincourt.